Here are some facts about Corfe Castle. Corfe Castle is located in the village of Corfe, in the English county of Dorset. It is located on the isle of Purbeck, which is actually peninsula rather than an island. The castle was built on that spot as it guards the only natural route through the Purbeck Hills. The name Corfe comes from an old English word meaning cutting, or gap. The castle was built by William the Conqueror, during the 11th century, for defensive purposes. It was one of the first stone castles in England; most earlier castles were built with wood and earth. The surrounding landscape has many Bronze Age burial sites, and the area around Corfe Castle has been occupied for thousands of years. The National Trust banned metal detectors from being used on the site. During Medieval times, Corfe became a Royal castle and King John kept his crown jewels there. The original arrow slits and murder holes can still be seen in the castle. The murder holes were used for pouring boiling water on to anyone attacking the castle. Corfe Castle was largely demolished during the Civil War, under orders from Parliament. Many villagers even used the stones to build their own houses. Ravens nest at Corfe Castle; local legend says the castle will crumble if the birds leave. Buzzards, falcons and redstarts can also be seen around the castle. One of the most famous British writers was inspired by Corfe Castle. Children’s author Enid Blyton used it as the basis for her Kirrin Island in the Famous Five series of books. 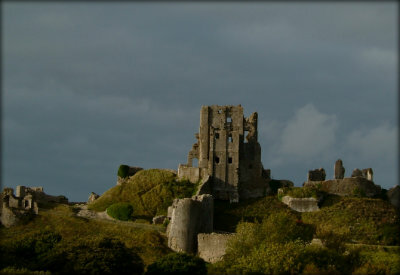 Corfe Castle is managed by the National Trust today. The castle regularly hosts living history days in which volunteers dress, eat and live as they would have done in Norman and Medieval times. What next? Discover some more castle facts or learn more about the Normans. My familys original name was Corfe before they came to America. It was changed to Corfee.